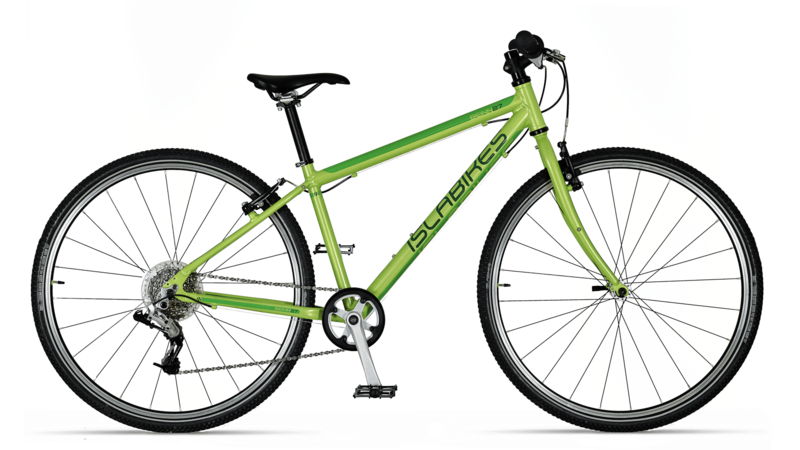 Islabikes have announced the launch of a new bike in their popular Beinn range. In what we believe is a first in the kids bike market (I'm sure our readers will tell us if we're wrong!) they've released a 27.5" wheel hybrid bike, aimed at kids aged 10 and over. What's different with the new Beinn 27? Well, it goes without saying the wheel size. The Beinn 27 comes with 27.5" wheels (obviously "Beinn 27.5" doesn't trip off the tongue quite so nicely!). The rims are Islabikes aluminium double wall, 24 hole, with black steel spokes. They are wearing the Islabikes own lightweight 72TPI tyre, with wire bead, puncture protection and reflective sidewall. With the wheel size as a starting point, the geometry of the Beinn 27 has been adjusted to give the same stand-over height as the old Beinn 26 Large (68cm minimum to 80cm maximum inside leg). Islabikes claim this will give riders more speed and stability when the going gets bumpy, whilst utilising a modern wheel size. There are some minor changes to the chainstay area, but virtually everything else remains the same as the old Beinn 26 Large. This means a 7005 T6 heat treated aluminium frame, aluminium mini V-brakes front and rear, coupled with Islabikes aluminium micro levers. The Beinn is fitted with a Sram X4 medium arm rear mech, Islabikes aluminium 32t chainring and Sram 8sp 11 – 32 cassette. As you'd expect from Islabikes, the saddle, pedals and levers are all proportioned to suit a child, rather than an adult. Are 27.5" wheels too big for a child? Yes, if they're attached to an adult sized bike with adult sized components. However, if they're attached to a bike that has been scaled to fit a ten year old, then the answer is probably not. The bigger wheels should offer more stability when riding off road, and give greater speed, as it's less work pedaling on larger wheels. Is this move to 27.5" wheels on a kids bike good news? If you're a Cycle Sprog who's aged 10 to 12 years old - yes! You get to ride a bigger wheeled bike, which is what everyone is doing these days. You'll go faster and probably have more fun. If you're the parent of a Cycle Sprog, then this is mixed news. If you're a fast rider, and fed up with waiting for your child to catch up, then this is good news. If they're already riding at the same pace or faster than you, then now's the time to start thinking of an e-bike! What's happened to the Islabikes Beinn 26 Large? Why are Islabikes making these changes? Islabikes have told me "It is an update we’ve wanted to make for a while, as it is our policy to always get kids on the biggest wheel size possible. We've done this by tweaking the geometry to accommodate a bigger wheel whilst maintaining a low bottom bracket height." It doesn't surprise us here at Cycle Sprog that Islabikes are tweaking their bikes at this end of the age spectrum. An entire generation has grown up on Islabikes, and there's been a definite gap in the market for when children grow out of their 26" wheel kids bike (as we're currently experiencing with our eldest Cycle Sprog). Given there's also a growing trend for bigger wheel sizes for adult off road and gravel bikes, with this move Islabikes are again moving the bar in terms of what kids bikes should deliver. It is surprising to us however, that they're not providing a choice of frame sizes. With the Beinn 27 having the same standover height of the Beinn 26 Large, Islabikes are still targeting the 10+ market with this bike. We saw Frog Bikes release the Frog 78 earlier in the year aimed at an even taller age range (although these bikes still have 26" wheels), so it will be interesting to see if Islabikes continue to develop this end of the age range (and indeed if Frog come back with a 27.5" wheel version). Where can an Islabikes Beinn 27 be bought? 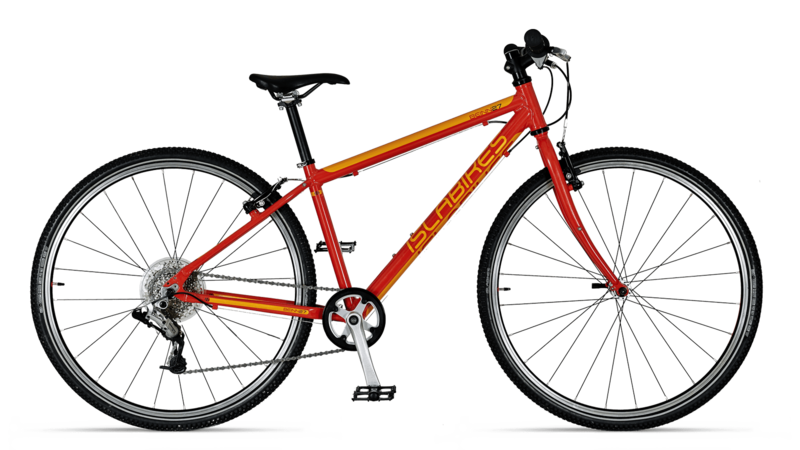 The only place to get hold of a Beinn 27 is direct from Islabikes, either in person at their Ludlow showroom, or on their website. The Beinn 27 retails at £439.99 and is available in a choice of red, green, or teal. What do you think of the new Islabikes 27 - would you be keen to get your child onto 27.5" wheels as quick as possible? Or do do think they should learn their craft on 26er? Do leave us a comment below. Children’s bikes – what’s so good about Islabikes?